The Chess Lessons. Tests. Samples. Strong chess masters have a very good understanding of middlegames and endgames. Their feeling for the position and the ease to play correctly in various positions stand out from amateurs. That is why an important part of the Grandmaster Package is constituted by advanced chess lessons on middlegames and complex endgames. 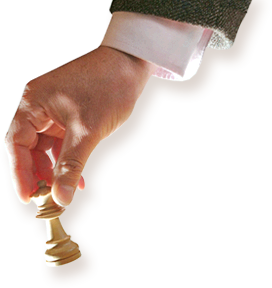 Our chess lessons explain in depth what to do in the most frequent situations and positions on the chess board. The student will be 'armed' with a solid knowledge of chess strategy, patterns of play, advanced techniques, and many other tools to help during the game. Although many players know a lot of theory, they have problems in applying their knowledge to practice. A key element of our chess lessons is to explain how to do, how to think correctly, how to find the best idea and move in various positions, or how to guess your opponent's plans. The practical part of any training program is VERY important and should be around 50% of a student's work. In the Grandmaster Package, the theoretical lessons are combined with instructive games with quizzes, exercises on more levels, tests, and positions for analysis. The solutions are like lessons on their own and, again, explain how to find the best move or idea. The last 4 months of the course are based on chess tests with extensive annotations, plus advanced lessons on the technique of winning the game. This unique segment of the course will turn a well-prepared student into an efficient player, ready to play like a strong master. "I'm nearly finishing the GM chess course...I'm also chess teacher and I have never found better chess material for improving chess level." - Daniel M.